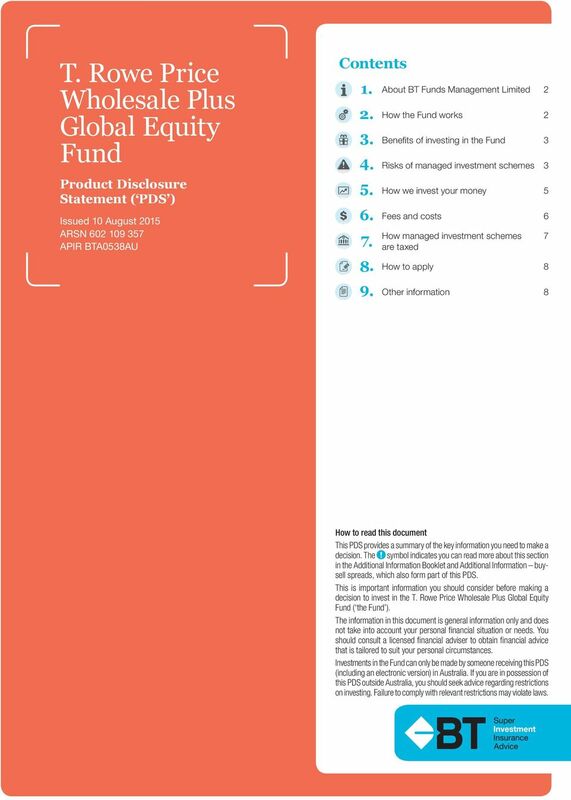 Download "T. Rowe Price Wholesale Plus Global Equity Fund"
6 6. Fees and costs DID YOU KNOW? Small differences in both investment performance, and fees and costs, can have a substantial impact on your long-term returns. For example, total annual fees and costs of 2% of your account balance rather than 1% could reduce your final return by up to 20% over a 30-year period (for example, reduce it from $100,000 to $80,000). You should consider whether the features, such as superior investment performance or the provision of better member services justify higher fees and costs. You may be able to negotiate to pay lower management costs. Ask the Fund or your financial adviser. 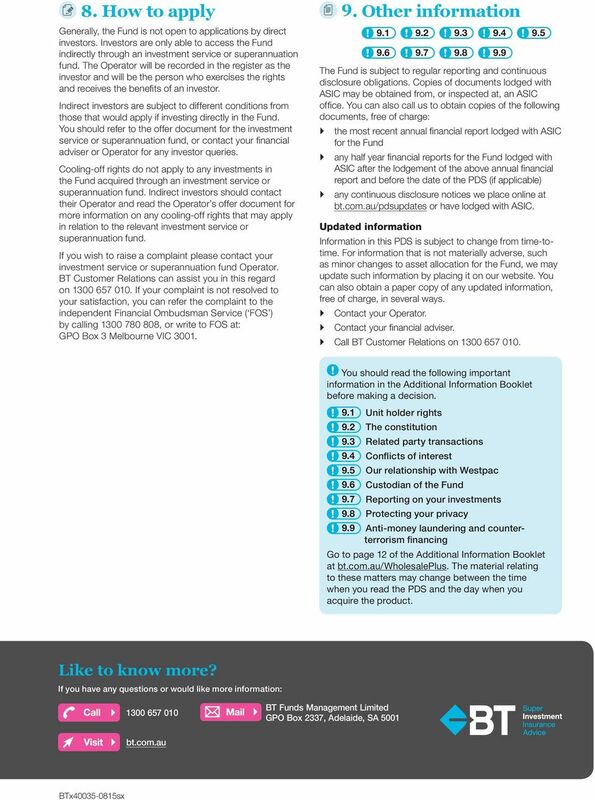 TO FIND OUT MORE If you would like to find out more, or see the impact of the fees based on your own circumstances, the Australian Securities and Investments Commission ( ASIC ) website ( has a managed investment fee calculator to help you check out the different fee options. This document shows fees and other costs that you may be charged. 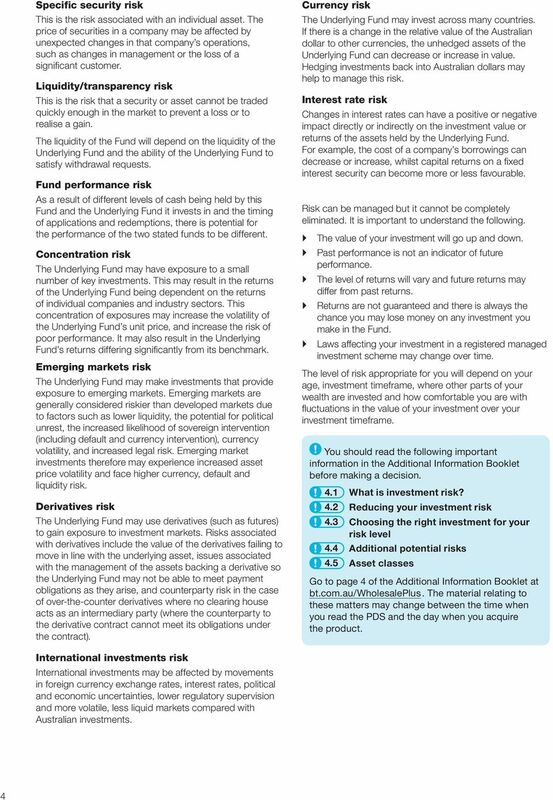 These fees and costs may be deducted from your money, from the returns on your investment or from the assets of the Fund as a whole. 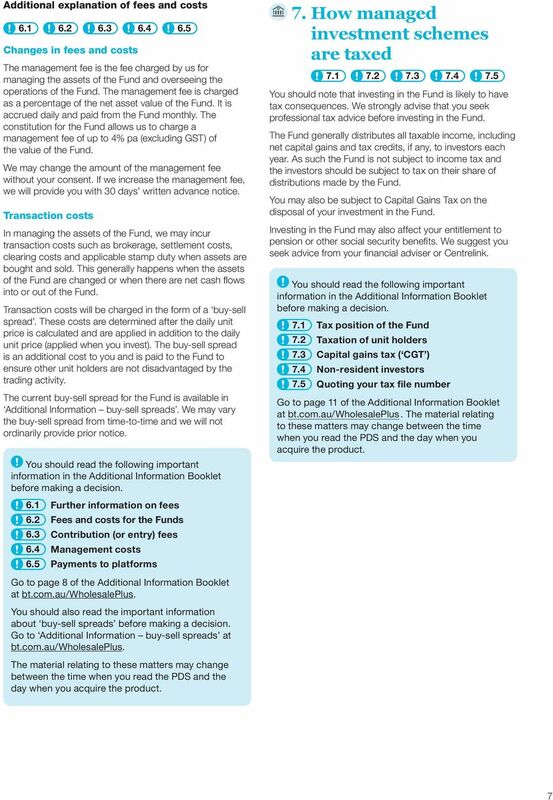 Taxes are set out in another part of this document and section 7 of the Additional Information Booklet. You should read all the information about fees and costs because it is important to understand their impact on your investment. 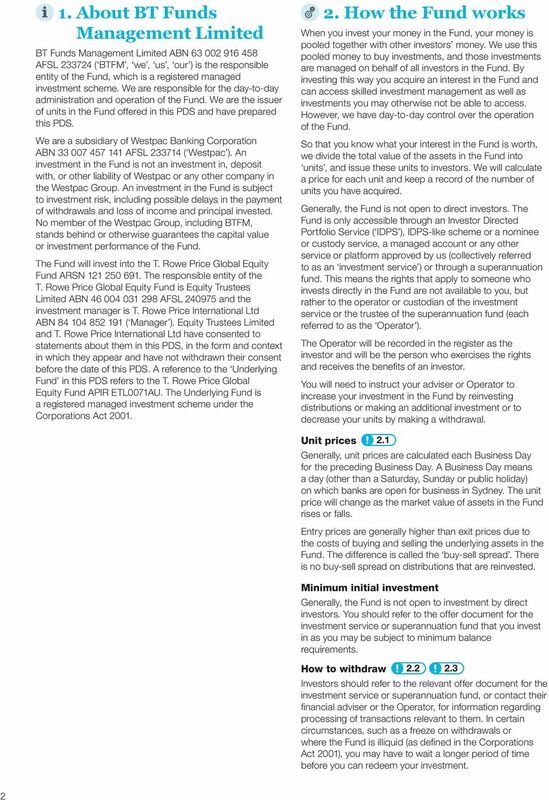 You can also use this information to compare the costs between different simple managed investment products. Type of fee or cost 1,2 Fees when your money moves in or out of the Fund Establishment fee Contribution fee Withdrawal fee Exit fee Management costs The fees and costs for managing your investment 3 Amount Not applicable Not applicable Not applicable Not applicable 1.00% of the net asset value of the Fund per year 1_ Unless otherwise stated, all fees quoted in this PDS are quoted on a GST inclusive basis and net of any applicable Reduced Input Tax Credits. 2_ Fees in this PDS can be individually negotiated if you are a wholesale client under the Corporations Act. 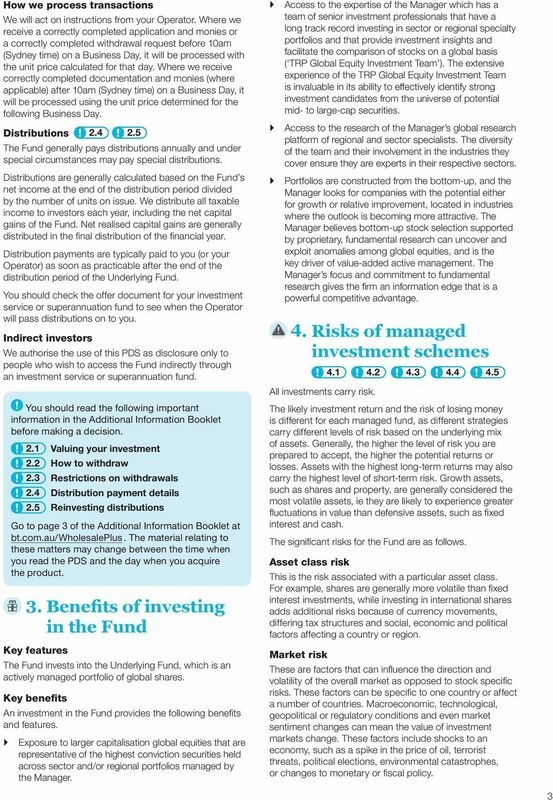 3_ The management fees are paid from the assets of the Fund and are reflected in the unit price of your investment. 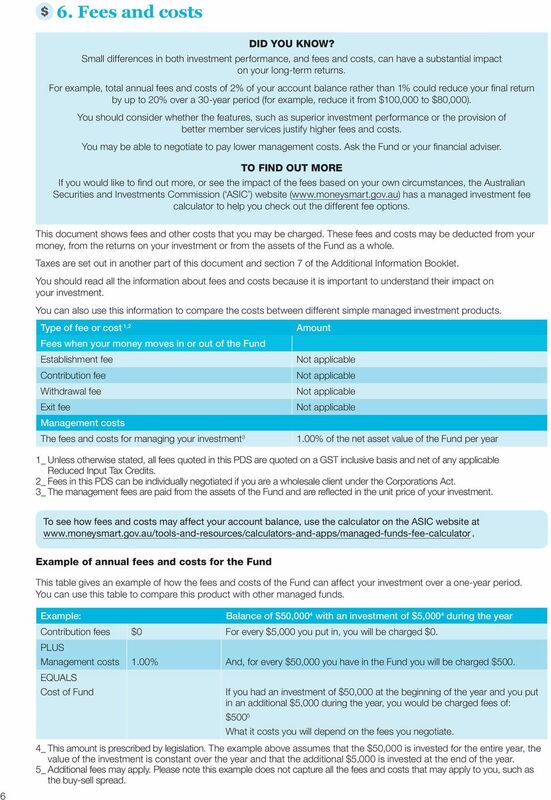 To see how fees and costs may affect your account balance, use the calculator on the ASIC website at Example of annual fees and costs for the Fund This table gives an example of how the fees and costs of the Fund can affect your investment over a one-year period. You can use this table to compare this product with other managed funds. 6 Example: Balance of $50,000 4 with an investment of $5,000 4 during the year Contribution fees $0 For every $5,000 you put in, you will be charged $0. 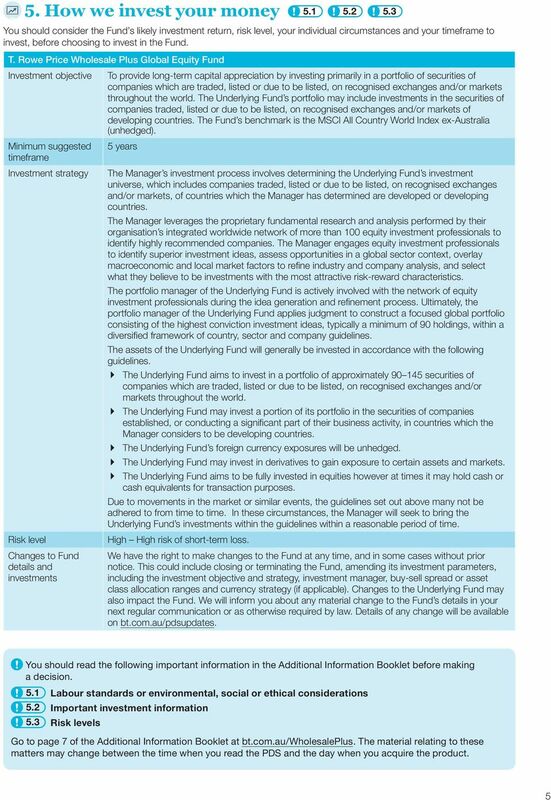 PLUS Management costs 1.00% And, for every $50,000 you have in the Fund you will be charged $500. EQUALS Cost of Fund If you had an investment of $50,000 at the beginning of the year and you put in an additional $5,000 during the year, you would be charged fees of: $500 5 What it costs you will depend on the fees you negotiate. 4_ This amount is prescribed by legislation. The example above assumes that the $50,000 is invested for the entire year, the value of the investment is constant over the year and that the additional $5,000 is invested at the end of the year. 5_ Additional fees may apply. Please note this example does not capture all the fees and costs that may apply to you, such as the buy-sell spread.